YONDELIS (trabectedin) and HALAVEN (eribulin) are the first chemotherapies originally derived from marine life, although they are now synthetically made. Both drugs are approved for the treatment of liposarcoma, and Yondelis also for the treatment of leiomyosarcoma. YONDELIS (trabectedin) and HALAVEN (eribulin) are the first chemotherapies originally derived from marine life, although they are now synthetically made. Both drugs are approved for the treatment of liposarcoma, and Yondelis also for the treatment of leiomyosarcoma. These conditions are types of soft tissue sarcoma, meaning that they are among at least 50 rare cancers that have individual characteristics but start in the body’s connective tissues. Halaven is also approved for the treatment of breast cancer. YONDELIS was originally made from sea squirts, or the marine organism Ecteinascidia turbinata. It works by stopping the abnormal multiplication of cancer cells within the body that would otherwise spread, destroying nearby tissues. It does this by binding to and damaging the DNA in cancer cells, causing the cells to die. 1. Yondelis has two regions: one that binds to DNA and another that protrudes from the DNA so it can interact with cellular proteins, particularly DNA cleaving enzymes. 2. Yondelis binds to the minor groove of DNA, and this distorts the double helix, causing it to bend. 3. Most DNA-targeted drugs bind to the major groove. The binding of Yondelis to the minor groove allows the drug to interact with specific proteins in cancer cells, preventing cell copying and causing double-strand breaks in DNA. 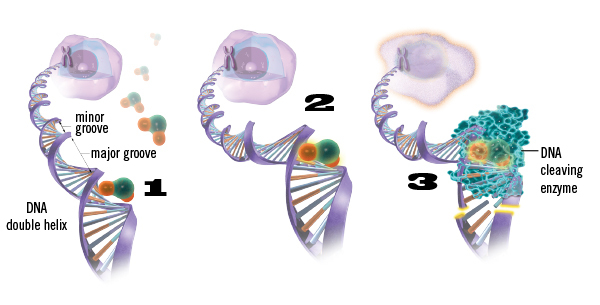 This leads to the failure of DNA to properly divide and, in turn, activates programmed cell death. HALAVEN was derived from an antibiotic substance, halichondrin B, that is produced by a type of black sponge that lives along the coast of Japan. The drug works by stopping the process of cell division within cancer cells. 1. The mitotic spindle is a mechanism responsible for furnishing newly forming cells with chromosomes, which contain each cell’s DNA. During mitosis, or cell division, chromosomes line up along the mitotic spindle. 2. The mitotic spindle is made up of microtubules, which are composed of tubulin subunits (dimers). 3. 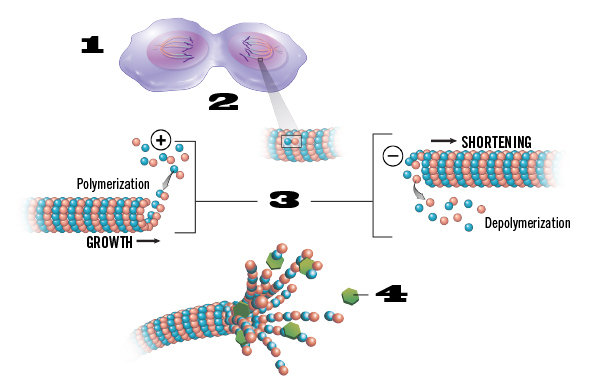 The microtubules are in a constant state of polymerization (growth) and depolymerization (shortening), which causes the microtubules to be unstable. This instability is a crucial component of mitosis. 4. Halaven blocks microtubule growth by binding to the growing ends of the microtubules. When this blocking occurs, cancer cell division ceases. The cells ultimately die. Halaven does not interfere with microtubule shortening.